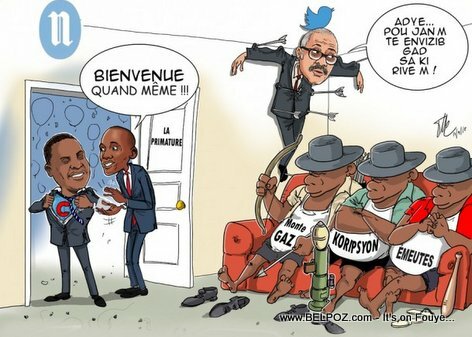 Take a look at a new Caricature published by Le Nouvelliste... Super Prime Minister Jean Henry Ceant walks in and you see outgoing prime minister Jack Guy Lafontant pinned to the wall by arrows crucifixion style. As President Jovenel welcomes PM Ceant to the Primature with a "Welcome anyway!" Lafontant says "as invisible as I am, look what happened to me!" A lot of thinking went into this caricature.